3D printing is set to change the way we relate to the products we buy and own. The ability to print spareparts and in the future the entire product itself promises to disrupt the conventional production chain. Already today the technology is a vital part of the FabLab's prototype development and design modus and it was therefore natural for us to try and scale the tech into a new area, namely the production of large scale structures suited for living and working. A while back we wanted to experiment with 3D printing in concrete. So we built a cartesian large format structure with off-the-shelf aluminium truss, self-designed carriages running on rollerskate wheels and stepper-motor controlled steel wire driven axises. One of the ideas of prototyping is to make mistakes and in the process of building Mimir we made several. The Z-axis proved to be a particular challenge, since the entire bridge containing the X and Y axis would be moved and it ended up with a total weight of almost 300 kg. We tried developing a system with a large central gear-motor lifting through a system of pulleys and steel wire, but it proved difficult to ensure an even pull on all four corners. So in the attempt to revive the project we needed to device a new movement mechanism for the Z-azis transport. To begin with we discard the single motor approach and instead we want a motor in each corner. To that end we found a simple 12V car winch in Biltema that could do the job. The winch is inexpensive and simple enough that we can modify it to suit our need. Firstly we need to know the rotation of the motor so the movement of the Z-axis is detectable. This is solved by adding an encoder to the spool shaft with a specially designed and 3D printed connector. 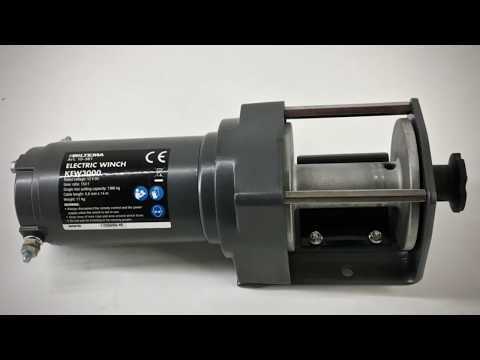 Secondly we need to control the winch DC motor. This solution is a bit more complex. The winch is rated to pull 1300 kg and the 12V DC motor will draw 100A when running at full capacity. This is a more than most readily available DC motor controllers and H-bridges can handle. We tried a few, bought on Ebay, but all failed either by being overloaded or by having unnecessary functionalities like time limits when changing direction. So we decided to build our own complete motor controller from scratch.